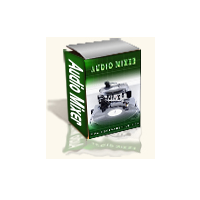 Free audio DJ Mixer makes it very, very easy to record over and add recordings to something you"ve already done. It plays what you"ve done along with your recording so you hear what you need to. Then adding it is simply a click away! The volume control for each track is really helpful, as well. Another great thing is just the overall simplicity of the whole recording process. One of the things, however, Choose from included music or select your own MP3s and then step up to the turntables and start mixing.